I had the opportunity to sit in a local courtroom for a few hours and watch as inmates in shackles from the county jail were brought before a judge one after another for a variety of criminal activities. I left feeling vulnerable and with a renewed awareness of the dangerous world I live in, and the need to keep my family and home safe from individuals who are intent on causing harm. If this is our world in a time of relative peace, what will happen when life becomes a battle for scarce resources and survival goes to the winner? How do I fortify my home to against criminals today as well as desperate individuals and looters after disaster strikes? Start by conducting a home security audit and then use those results to secure your home by creating layers of protection that include creating physical barriers and deterrents, securing valuables, practicing operational security, and making your home look like an unappealing target. While you can’t protect against every threat, you can make a substantial difference in the security of your home just by implementing a few of the strategies we discuss in this post. Our goal is to be safe and protected in our homes. In order to achieve this, we must physically fortify our home against possible hazards including; criminals, periods of civil unrest, and desperate individuals; as well as manmade and natural disasters. While it is impossible to protect your home from every threat, there are many things within your control you can do to fortify your home. In this post, we will discuss steps that you can take to harden your home against threats. An important part of your preparedness efforts should include fortifying your home against burglars today and the looters that may pose a threat after disaster strikes. Disasters have the ability to bring out the best in some people and the inner monster in others. In the process of securing our homes, we can also make it more resilient against the forces of nature. Remember that the goal is to protect your family first and then secure the resources that you have accumulated to take care of your family. We invite you to explore these steps with us and determine which of them make sense for your family when it comes to hardening your home against the forces of both man and nature. Securing your home is best accomplished by creating layers of protection. If someone really wants to break into your home, they could easily drive a bulldozer right through the front door. There is just not much that you can do to prevent that. Our goal is not to withstand a military assault, but to make the home a less desirable, extremely difficult target for anyone who may want to cause harm or steal valuable resources. The first priority is to protect the family, then precious resources. Never make your home so secure that you are unable to escape during an emergency. Or become so obsessed that you turn your home into a prison. Let us look at some smart changes you can make to add layers of protection to your home security. Many of them do not take much time or money. Take a moment to look at the exterior of your home through the eyes of a stranger. Does your home look like it may contain highly valuable stuff? Are there expensive vehicles in the driveway indicating the possibility of valuables inside? Are valuable toys in the front yard for everyone to see? It is best to just blend in with your neighborhood and stay as invisible as possible. Avoid having anything in plain sight which might be tempting. Make your home look secure, but not like a fortress. A home that looks overly secure signals criminals that you are going out of your way to protect something of great value. The overall appearance should be secure enough to deter potential burglars but ordinary enough stay under the radar. Park vehicles inside the garage. If you park your car in front of your home, keep it locked at all times. Do not leave a garage door opener in a car parked in the driveway. Deterrents are intended to make an intruder think twice before deciding to break into your home. Thieves avoid bright lights that may prevent them from taking advantage of dark or shadows for concealment. Install exterior lighting to aluminate doors and windows. Mount motion sensitive security lighting in strategic locations that will turn on with activity but will otherwise remain off through the night. Solar powered security lights are great for areas without access to electricity and will continue to provide light during a power outage. Set interior and exterior lights on a vacation timer when you are gone so that it will appear that someone is home. Use motion sensor nightlights inside your home. They light your path through dark hallways at night and automatically turn on when someone walks past. It may silently alert you to an intruder in your home. Visit our post, Brilliant Ideas to Literally Light Your World During a Power Outage for some great ideas on solar powered exterior lighting. Sounds or noises are another deterrents that may discourage a would-be thief and alert neighbors to suspicious activities. Security alarms use sound to disorient, discourage intruders, and warn that an area has been breached. Leave a television on or a radio playing to give the impression that someone is home when you leave the house. Barking dog alarms use microwave and radar technology to detect motion outside a door. Some sound like a German shepherd and the barking becomes more intense if motion continues. Driveway or outside area motion sensors will alarm when anyone enters the monitored area. Look around and you will discover a wide variety of security gadgets which use sound to add a layer of protection. Any dog that barks can be a great deterrent. 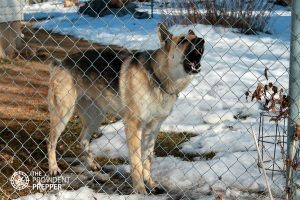 A dog with a deep, threatening bark may be the most effective, but the bark of any good dog can alert you to an intruder. It can also draw attention and may encourage the trespasser to move right past your home to find an easier target. During times of civil unrest, when people are desperate to survive, a father trying to feed his starving children may not be phased by a barking dog. Home security alarm systems are an effective layer of protection to add to your home. An alarm system can provide a few seconds of advanced warning and startle an intruder. Monitored alarm systems automatically alert the alarm company, who in turn contact local law enforcement. Actual response time can be very slow. Alarms will not stop someone who is determined to break into your home. System batteries can wear down quickly when the power is out. It is best not to plan on the protection of an alarm system during an extended power outage unless you have a back-up power system. Motion activated security cameras are an excellent way to track intruders and your surroundings from almost anywhere on your phone. These inexpensive cameras are easily installed and just their presence may be enough to deter an intruder. Physical barriers are designed to prevent unwanted access to your home and property. While physical barriers can be breached, they make it more difficult to access your home and can encourage an intruder to select an easier target. This may sound like a no-brainer but a lock is of no value if it is not used. There is no amount of additional security that can replace actually locking your doors and windows. Encourage family members to routinely keep the house locked up tight. Locking all points of entry requires an intruder to forcibly enter the home, making it a more difficult target. Keep track of all of the keys to your home. Rekey all locks if a key has been missing long enough for someone to make a copy of it. Never hide a spare key under the doormat or flower pot, above the door frame, in a fake rock by the front door, or on a window ledge. If you must hide a key, consider the following location. 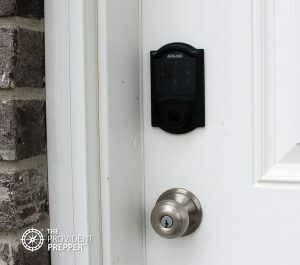 You may want to replace some keys altogether and use a SmartCode UL Deadbolt on a backdoor to provide access to your home for family members. It works similar to a garage door code. If a child loses a key, you need to rekey all of the locks in your home. If he accidentally shares the code, all you have to do is reprogram the code. It also allows for the additional security of changing the code regularly to make sure it has not been compromised. The landscape itself can either invite or deter trespassers. A well-planned landscape can create a beautiful environment while adding another layer of security to your home. If you do it right, it can be almost as effective as a razor barbed wire security fence, without attracting attention or looking frightful. Do not let your landscape provide easy concealment for trespassers. Keep windows and doors clear of trees or shrubs where someone might hide. Trim branches of tall trees away from the home to prevent access to second story windows. Keep hedges trimmed in the front of the home to less than three feet tall to avoid providing a screen for someone to hide behind. My favorite strategy is to plant thorny or prickly shrubs under windows to discourage even the most determined of intruders. Most roses are equipped with delightfully sharp thorns and are available in a seemingly endless variety of colors. Plant varieties that are a bit shorter when they mature directly under windows. Roses add beauty while creating another layer of defense to protect your home. It is best to build a tall, sturdy fence around your yard along with heavy-duty locks on sturdy gates that are always kept locked. If that is not possible, thorny shrubs and bushes create the perfect barrier as a hedge, or just inside of a fence, to discourage intruders from accessing your property. You may want to plant a combination of plants such as; bamboo trees with spiky holly bushes underneath. The bamboo creates a physical barrier while the holly makes access painful. A few impressive thorny candidates include; Juniper, Blue Spruce, Common Holly, Firethorn, Purple Berberis, Oleaster, or Fuschia. Edible shrubs or bushes will both provide security as well as feed your family. Consider planting boysenberries, raspberries, goji berries, gooseberries, blackthorn bushes, citrus trees, pomegranates, or perhaps wild plums. Some of these plants can be purchased in a thornless variety. If you are using them for security purposes, make sure to get the thorniest ones available. Prickly pear, a bushy cactus, is great for some desert climates. Doors are a vital point of entry that must be secured. Exterior doors should be made of solid wood, fiberglass, steel or aluminum in order to withstand the significant force and provide the greatest protection. The frame, strike plate, and hinges are just as important as the door itself. Consider improving the security of your existing door by making a few simple modifications. Replace the standard short screws in the strike plate with three-inch screws that will go through the frame and sink deeply into the stud. Door hinges should be high quality and sturdy. Replace them if needed. Install a wide-angle peephole in the front door to enable you to clearly see who is at the door before opening. 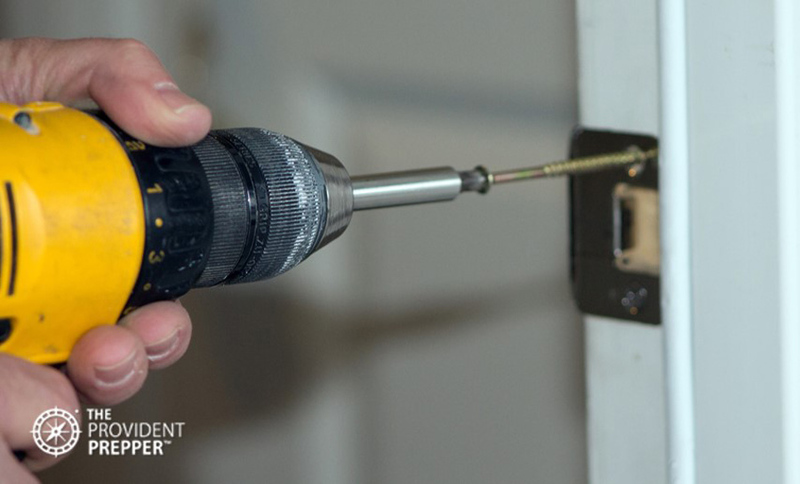 Install both a deadbolt and quality doorknob on all exterior doors and on the door between your home and garage. 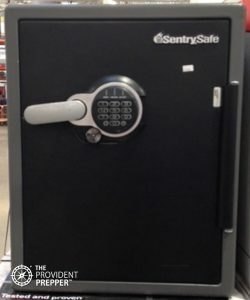 We recommend the American National Standards Institute (ANSI) Grade 1 lock such as this one at Home Depot. This grade of locks meet commercial building standards and provide the best residential security available. Glass panels and sidelights less than an arm’s length from a doorknob should be fitted with glass brick, grates or grills. Installing a double cylinder deadbolt that requires a key to open from both the inside and outside will solve this problem. It is important to keep a key handy, but out of arm’s reach, in the event, you need to evacuate quickly. You can add additional security to your existing door by using any of the items below. A quality home security bar such as; the Buddy Bar Door Jammer can prevent access through a door. This device is used to secure the door by wedging it under the handle with the base on the floor. The concept is similar to wedging a chair under the door handle to prevent it from opening. It provides additional security against unwanted intrusions, making it extremely difficult to gain access through the door. Portable door jammers are ideal for use while traveling. A barricade door bar or crossbars can be a great tool to effectively deny access through a door. The bar is secured to the wall on both sides of the door preventing the door from opening. Some bars are completely removable, while others only lift up while not in use. Sometimes they are referred to as Katy Bars. They do a great job of protecting from hurricane force winds as well as providing excellent security. A door lock barricade can be installed at the base of the door and is used at night or when additional protection is needed. You may want to upgrade to solid doors and install secure locks on bedroom doors. In the event an intruder gains access to your home, it may provide a few extra moments to prepare to defend yourself or escape out a window while he tries to break down the door. Storm doors or security doors can add another layer of protection. Storm doors are designed to increase energy efficiency but can help secure the home as it is more difficult to break through two doors than it is to kick down a single door. Security doors are designed to intentionally prevent forcible entry and can offer some protection against storms. These doors also add a layer of protection between you and the stranger at the door. Sliding glass doors are a weak point in home security. Some can be simply lifted right out of their tracks from the outside. The locks are easily pried open or unhooked by wiggling the panel or can be cut with a hacksaw. Devices that will increase the security of a sliding glass door include these inexpensive solutions. Track locks will fit nicely into the track at the base of the door and prevent the sliding door from being opened. You can also just insert a metal or wooden dowel into the track to make the door more secure. Double bolt locks can be easily installed and will prevent the door from being lifted out of the tracks. Sliding door locks should be installed at both the top and bottom of the door to ensure the door is secure. Sliding door loop locks secure to the jam and will prevent the door from being opened. Step-on sliding door locks can inexpensively secure a sliding door and can be easily unlocked with your foot. None of these will prevent someone from breaking the glass to gain entrance. Security window film can be applied to the glass and will add an additional layer of protection. An exterior security door will greatly increase the security of a sliding glass door. Windows are vulnerable points of entry and can be easily broken or pried open. Keep windows closed and locked when you are not home. Some sliding windows can be lifted out of their track from the outside. It is well worth the effort to secure the windows in your home. Keep in mind you may need to escape out a window during an emergency. Never compromise safety in the name of security. Consider some of these ideas to provide an additional layer of protection to secure your windows. Horizontal sliding windows can be secured by placing a wooden dowel in the lower track. Window locks are relatively inexpensive. We avoid key-operated locks because we do not want safety compromised during an emergency exit when we cannot locate the key. Window latches and sash locks are easy to install and effective. Visit your local home improvement store or search Amazon for a wide variety of options. Keep window blinds or curtains closed after dark. Do not let burglars know exactly who is home or what to expect if they get inside. Install blinds, curtains, or reflective film on garage windows to prevent contents from being visible. An empty garage may signal a criminal that no one is at home. Tempered glass is four times stronger than standard glass, but will break and allow entry. It is not a good choice for home security. Roll-a-way security shutters are a great, but pricey, security option. They are controlled from inside the home and roll into place. Steel security bars or window grills can effectively secure windows but may pose a risk if the windows are needed for an emergency exit. Security window well covers are a great way to protect basement windows. 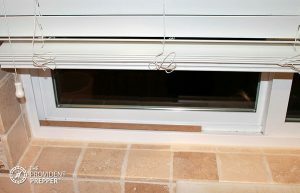 They can be secured deep inside the window well with a simple cotter pin or other locking devices. The cover prevents access, yet provides for a quick easy escape in an emergency. Make sure the occupant of the room has the strength to slide the cover off and climb out of the window well. Storm windows are uniquely designed to withstand punishment and provide increased insulation. Hurricane fabric is designed to replace traditional storm shutters and protect against hurricane force winds. Security window film can be installed on the inside of the window. The glass will still break, but the film holds the pieces together to prevent entry. Businesses commonly have security film installed to protect against smash and grab thefts. In the event that an intruder makes it through your layers of protection and gains access to your home, make your valuables as inaccessible as possible. Keep adding layers of protection. They are usually in a big hurry and want to get out before being caught. Store valuables in unlikely places. Engrave valuable items with “This Property Stolen From …” and include your driver’s license number. Marked property is much more difficult to fence and easier to return to the rightful owner. Most criminals will search for valuables in a master bedroom first. Bathrooms, kitchen, hallways, mudroom, and laundry room are your best bet to store your valuables. Firearms, cash, and vital documents are best kept in a fireproof safe. Many break-ins are drug-related and items of value include prescription medications, cash, and items that can be sold quickly to make money. Food storage is a highly valuable resource. Protect it behind a strong, locked door. Consider creating a few different caches so that if someone gains access to one area you will still have supplies stashed in another location. Tops of closets, under beds, inside of suitcases, behind items on shelves, or inside of boxes labeled something boring like “Grandma’s Old Clothes” are just a few creative places to store food where no one would think to look. Diversion safes are small safes that are made to look like common items that you just tuck away with similar items. I found a variety of fun diversion safes including; shaving cream can, soda can, coffee can, paint can, bleach bottle, hairbrush, or my personal favorite a sour cream and onion Pringles can. You can purchase commercially produced diversion safes or with a little bit of creativity use the ideas to create your own. In a recessed medicine cabinet disguised to look like a painting or inside of a picture frame safe. In empty food containers inside a kitchen cupboard or pantry. Does that stimulate your creative thinking? Where could you stash valuables? Considering everywhere you may stash your valuables, it may be a good idea to keep a master list so that you can find them when you need them. Some of these techniques only work if you keep it a secret. Remember, children love to share information with their friends, who tell their friends and parents and teachers and soon everyone knows. Do not make yourself into a target by spreading the news. Operational security is a process of identifying potential threats and taking action to eliminate or reduce them. As applied to emergency preparedness, this means you take time to learn who lives in your neighborhood and what the potential threats are in your area. Be observant. 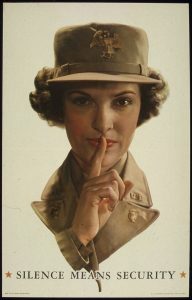 “Silence Means Security,” was the Women’s Army Corps anti-rumor slogan in 1941-1945. The security of the nation depended upon silence. Small conversational slips can compromise your security as well. Who might be listening to your conversations, monitoring social media, or noting the supplies taken into your home? Take care not to put your family in danger through careless conversation. Downplay your level of preparedness and share specific details on a need-to-know basis only. We encourage you to be prepared, and willing to share during tough times, but to do so anonymously for your own protection. The best way to discover your vulnerabilities is to look at your home through the eyes of a thief. Get in the mood by changing into dark clothing, pull up a hood to obscure your face or go all out with a nylon stocking, or ski mask to hide your face. Now inspect your home through the eyes of someone who is desperate to gain access to your home. Make it into an adventure and involve the entire family. It will be quite an education. Start your adventure in the street in front of your home around dusk. What can you see through the windows? Are valuables such as televisions and computers easily visible and tempting? Would a stalker be able to see family members and observe activities inside the home? Where can a bad guy possibly hide? Are all points of entry visible and well lit? Look at the borders of the property. Can someone gain easy access by hopping a fence or opening an unlocked gate? How can the home be made more secure and less inviting to possible intruders? Challenge your family to gain access to the home without using the garage code, key, or breaking anything. You may learn a trick or two from your kids and be surprised how easy it is to find an open door or window. Is there a key hidden in a traditional hiding place? Find the vulnerable areas of your home and write them down. Remember, no amount of extra security can replace actually locking the doors and windows. Congratulate your team of masked bandit volunteers on a job well-done. Gather around the table and provide some well-deserved treats. Review the notes from the inspection and enlist the help and ideas of your team to come up with an action list to fortify your home. A truly secure home requires the buy-in of everyone who lives there. Take steps to correct your deficiencies and improve security. Repeat the process as often as needed in order to make sure your family and possessions are safe. Your home is one of your most valuable assets. It can protect you from harsh weather, dangerous people, and is a place of refuge. If at all possible, it is our plan to face life’s challenges from our own home. Consider your individual circumstances and come up with a realistic plan to add layers of protection and increase the security of your home.